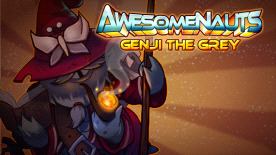 Genji the Grey wizard is not some conjurer of cheap tricks. He's a trusty companion for any questing party in need of his wisdom or his crafty smoke rings! Are you in need of some some fireballs, wisdom and balrog smiting? Look no further than Genji the Grey!